Deep into sweater weather, I'm thinking something other than a sweater would be fun to wear. Like a poncho, for instance! It's a warm, cozy, easy-to-throw-on layer (not necessarily limited to the chilly outdoors, either)--and stands out from the crowd! I love these statement-making indoor-friendly styles by Michael Kors, Club Monaco, Derek Lam, Maison Scotch, Mango, and Burberry (on sale!). The one pictured above is by Free People and is on sale here. The Mango link goes takes you to the Maison Scotch poncho-- can you pls fix it? Thanks for all the amazing suggestions, Marlien! 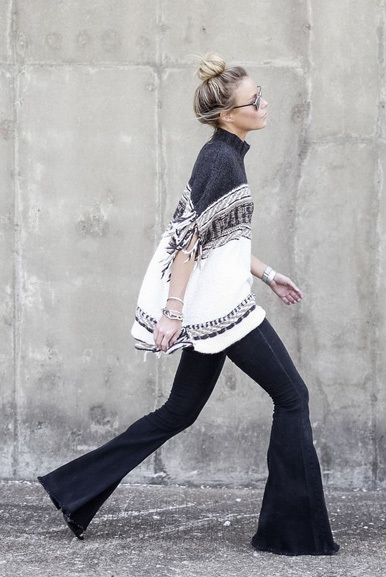 Can't get enough of the poncho trend. Love it!